Give the gift of relaxation with this set of all-natural, spa-quality facial products. A relaxing at-home spa day? You've got this in the bag. Literally, though. 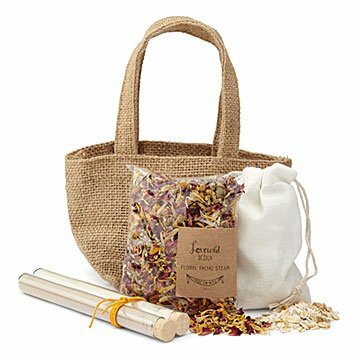 Find everything you need for some good old-fashioned pampering packed tidily away in this jute basket. Each one contains eucalyptus bath tea, three facial clays, and a facial steam, so you can indulge in a quick pick-me-up, or go all out for hours of relaxation. Make it a gift for a friend in need of peace and calm, a new mom, or, hey, yourself! Handmade in Brooklyn using paraben-, phalate-, and artificial-fragrance-free ingredients. clay, dried flowers, essential oils, recycled paper, epsom salt, oats, jute basket, jute basket.